There are many things you need to consider when planning an exhibition and the size of your exhibition stand space is one of the first and most important decisions you will need to make in the planning process. Size isn’t everything and a small exhibition space can often be an advantage. For some companies having a large floor space to fill is simply too costly and time consuming and the budget and team won’t make allowances for it. Therefore a smaller exhibition stand – when executed well will produce better results and have a greater impact on your business. The ultimate goal for any exhibition is getting a return on your investment and producing quality business leads and contacts for future business ventures. Here are 5 useful tips that will help your smaller exhibition space work for you – not against you! Once you have your floor space you need to decide how to fill it. Your exhibition display is the first thing you need to choose as this will be what takes up most of the floor space. There are many different display solutions out there so here are some of our more popular options. A pop up display stand is a highly portable and very effective promotional display that doesn’t break the bank. Pop Up Display Stands are an industry standard for exhibition stand displays. They are an ever popular option with businesses and marketing companies because Pop Up displays are an easy to set up portable display giving maximum exhibition backdrop coverage. With the ability to go in the back of any car, the pop up display stand is the ultimate large format portable display stand. 5 different size options are available in both curved and straight designs to suit any promotional application. We offer a wide range of pull up banners all of which are an easy to use, cost-effective and a highly portable display solution. Banner stands are ideal for exhibitions, events and trade shows and can be used on their own or combined with other display products to create an eye-catching and effective display stand. Our entry level Grasshopper roller banner is a cost effective banner stand available in 5 widths from only £49.00. The Barracuda roller banner stands are one of the UK’s bestselling pull up banners. 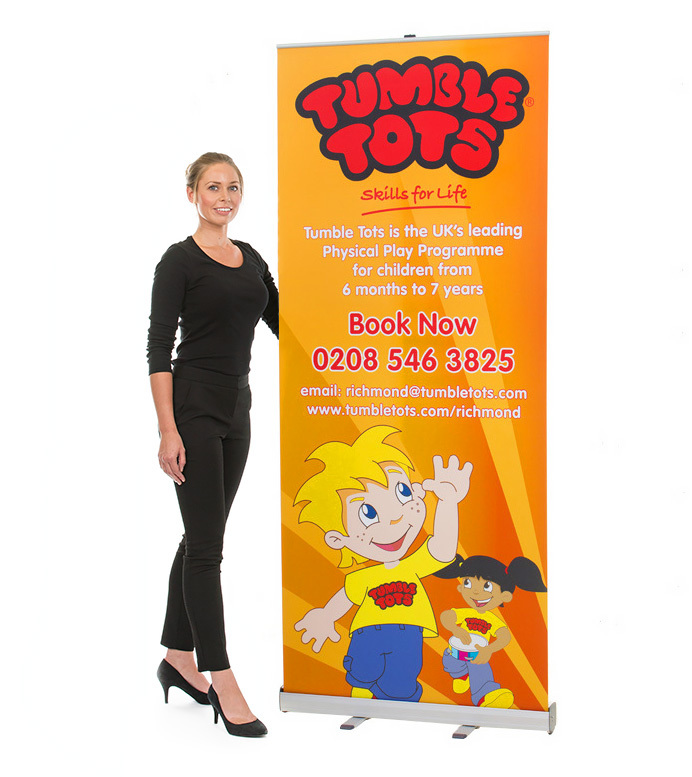 A reliable, long lasting pull up banner which is easy to use and transport and comes with a 5 year hardware warranty. Banner stands don’t require a lot of space but create high impact displays when designed correctly. The Twist 3 Panel Flexible Displays System is a truly eye catching exhibition backdrop and shell scheme system that is not only portable but offers the flexibility to grow with your business and display marketing needs. 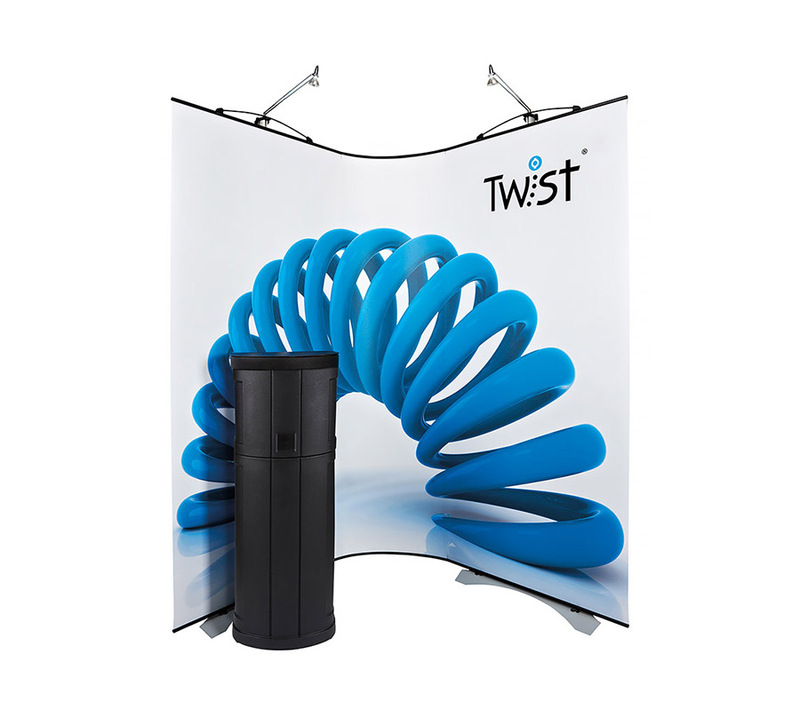 Twist banner stands are undoubtedly one of the best portable display solutions for when you need to create a versatile and flexible exhibition display that can be configured and re-configured to fit any exhibition stand space. The Twist base has a small footprint and can be pushed right up to the shell scheme wall to maximise your floor space. The flexi panel allows you to bend and flex the stand right into the corner making sure there is no unused space in your exhibition stand. 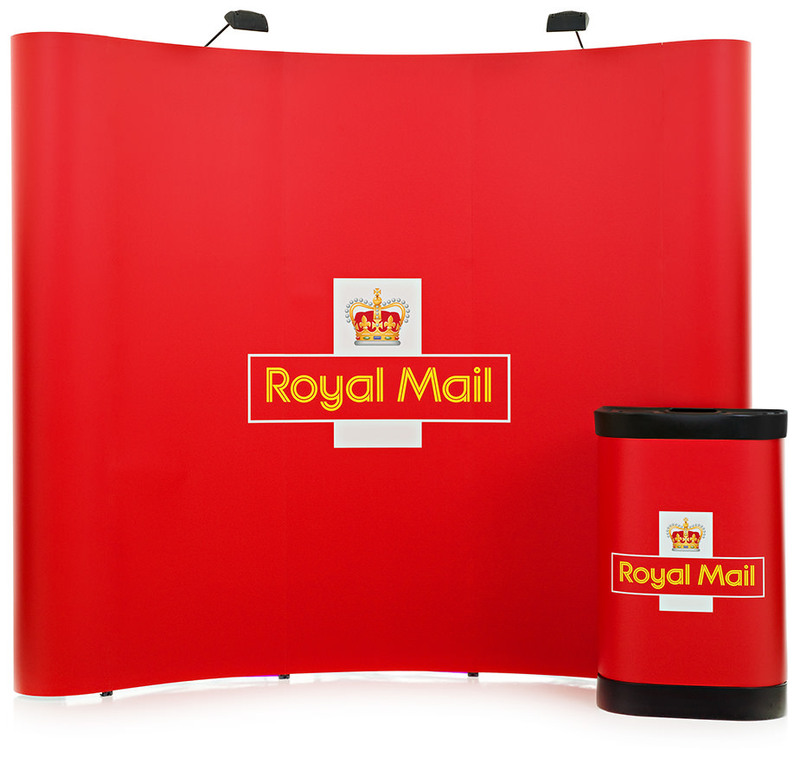 The 3 panel kit can be spilt up and used as singular banners or linked together to create the 3 panel system. You can add more banners any time you wish which is perfect for companies looking to expand and grow their business. When attending any exhibition you should always take some promotional literature along with you. It is ideal for handing to passers-by or people who have visited your exhibition stand and require some additional information to take away with them. This can be your company brochure outlining your business services or products. If you don’t have a brochure then it’s a good idea to have some leaflets designed and printed which is specific to what you have to offer at the exhibition. If it’s a new product you are launching – a technical specification leaflet or mini brochure will work well. We offer a wide range of literature stands which are designed for use on exhibition stands. They have a small footprint so they don’t eat up much of your precious floor space. They can hold an adequate amount of literature and are often best placed on the edge of your exhibition stand – this allows people to view your information when passing which will encourage people to stop by. Lighting is a must for any exhibition stand and definitely one of the most effective ways to make sure your exhibition stand is noticed. Small spaces in an exhibition hall can often look dull and gloomy. Clever use of lighting can make the space feel and look bigger. Easily installed on both the pop up stand and the banner stand, spotlights perfectly highlight the graphic design helping colours to really catch the eye. Our spotlights are adjustable so you can choose where you want people to focus on the banner stand, for example your contact information, company logo or the graphic itself. Illuminating your exhibition stand is one way to ensure your brand gets noticed. 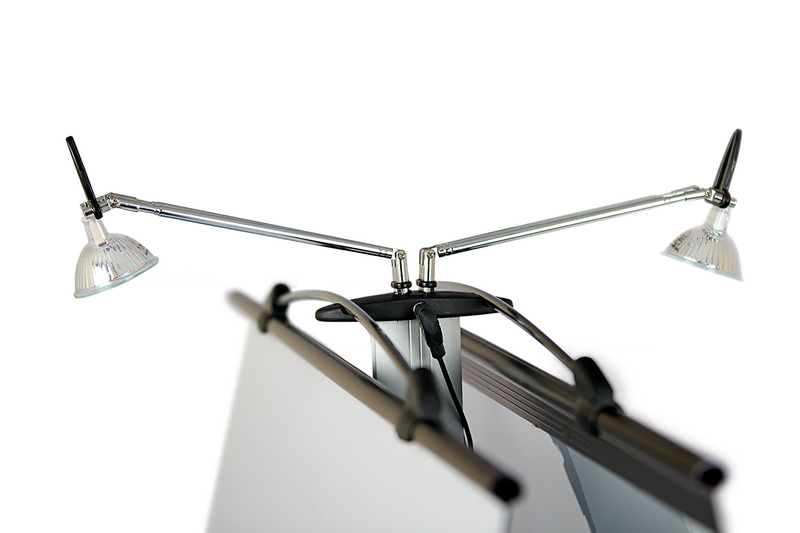 Monitor brackets are available for both the pop-up stand and the banner stand and help to bring vibrancy and movement to your stand. There is an ever growing demand for audio visual equipment on exhibition stands. If your space is small and doesn’t allow much room for additional items then a screen can be the next best thing. By having a well presented professional presentation slide or demonstration video you can promote everything you need to. It can often have more of an impact on visitors as it’s a predetermined informative script that tells your customers what they need to know. Alternatively, have an iPad or tablet on your stand to make it truly interactive. 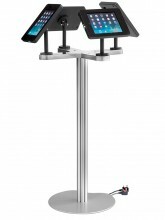 Our iPad stands are perfect for adding an interactive edge to your stand. iPad technology and cool gadgets not only help attract visitors to your stand, they can also be a great way of lengthening the time your visitors spend on your stand. They only require a small space on your exhibition stand yet they create an enjoyable customer experience. You are able to gain access to all types of digital media when required and by having this advantage and technology you will have the edge over stands that do not. With a small exhibition space there is no room for mess –no bags, coats or cups of tea laying around. It’s unprofessional to have these things on display but with a smaller space it’s important you use the space wisely for marketing material. An untidy and cluttered stand will have a negative effect on exhibition attendees. No one wants to visit a disorganised and unprofessional exhibition stands so it’s important that everything has a place and your space is used to its fullest potential. Have you got any useful hints and tips? Share them with us on Twitter or Facebook. At XL Displays we supply everything from custom built exhibition stands to portable display equipment such as pop up displays and banner stands.